Hardwood floors are very popular for their attractiveness and durability, and can last a lifetime. However, depending on the age of your home and the wear and tear the flooring has gone through, it may eventually need to be replaced. If you live in a humid, rainy city like Miami, Florida, for example, moisture can have an especially damaging effect. You may be interested in installing a new hardwood floor in its place or in changing the floor to something else like tile or carpet. Either way, the hardwood will have to be removed, so here are some instructions to help you. The ease with which a floor can be pulled up depends on how it was installed. If the floor was glued to the subfloor, you’ll need a circular saw to remove it. When using the saw, make sure it’s set to the thickness of the flooring so that you don’t do any damage to the subfloor. Cut the floor into two-foot sections. Once the floor has been sawed, you’ll need a crowbar and a small sledgehammer. Stick the crow bar beneath the panels and hammer it. This should pry up the floor. If it isn’t working, try cutting the floor into smaller sections. In some cases the hardwood is attached too strongly to the subfloor and you won’t be able to pry it up. If the subfloor is also wood you can saw through both, provided your circular saw is on the right setting. However, this will mean you’ll have to install a new subfloor. If the subfloor is concrete, you’ll need a professional flooring contractor to do the job. The most common type of hardwood floor has tongue and groove edges nailed together. The planks snap into one another and are attached with nails, placed at 45-degree angles, hidden by the planks. 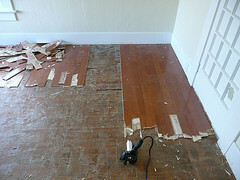 To remove this type of flooring, begin from the last panel that was installed -- which is the one with nails showing. If you can manage to get a crowbar in between the wall and the floor, you can begin with this piece. If not, you’ll need to use a circular saw to cut along the length of the plank. Once it’s cut, you can use a crowbar to pry it up. After the first plank is removed, the rest will be relatively easy. However, you may need to use a hammer and chisel to remove some smaller sections. When removing your hardwood floor, try to keep it as intact as possible. The pieces you manage to remove undamaged can come in handy. You can sell them to a salvage yard or construction company, or use them yourself in a future project. Don’t try DIY hardwood flooring removal unless you have solid experience with carpentry or renovations. If you don’t have the necessary tools or are not comfortable removing the floor on your own, you should contact a reliable flooring contractor.